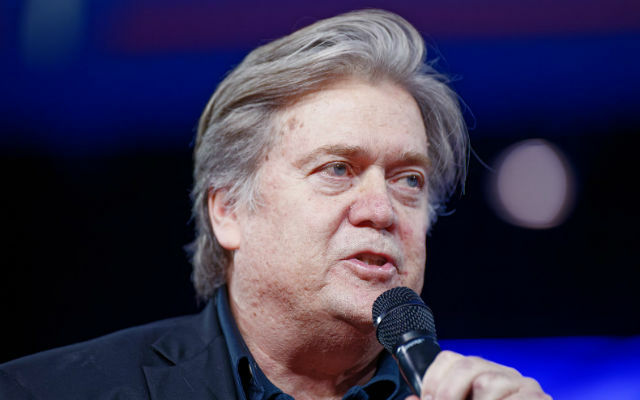 “The K Street crowd, the donor class and the politicians they own, they’ve taken this country in a very, very dangerous direction,” Bannon said, referring to the street many Washington lobbyists have their offices. Bannon also criticized the speech delivered by former President George W. Bush Thursday which was critical of President Donald Trump. “President Bush to me embarrassed himself,” Bannon said. “The speechwriter wrote a highfalutin speech. It’s clear he didn’t understand anything he was talking about. Bannon also predicted that if Trump is re-elected in 2020, California will try to secede from the United States in 10 to 15 years. An estimated 100 people, mainly members of The Resistance-Northridge, Indivisible and Indivisible OC 46, protested outside. They were kept from the hotel by barricades. Saturday’s agenda includes a lunch banquet speech by House Majority Leader Kevin McCarthy, R-Bakersfield, afternoon speeches by Fox News Channel host Jeanine Pirro, writer Stephen Moore, Americans for Tax Reform President Grover Norquist and conservative activist Charlie Kirk; and a dinner banquet speech by Sen. Tom Cotton, R-Arkansas. The three-day convention will conclude Sunday with a general session considering resolutions.